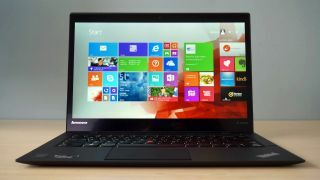 The Lenovo ThinkPad X1 Carbon is one of the laptops on offer. The British government is looking to swap BYOD (bring your own device) with CYOD (choose your own device) in what has been called a "major technological transformation" within the Tory-led government. As part of the deal, more than 2000 civil servants have been asked to choose between five laptops (rather than being give one by default). On offer were the MacBook Air (11 or 13-inch models), the Dell XPS 13, a Lenovo ThinkPad Yoga S1 or the Lenovo ThinkPad X1 Carbon, the latter retailing for more than £1,000. A spokesperson has confirmed that staff at the Cabinet Office, the Department for Culture, Media and Sport and the Crown Commercial Service have been offered the option to choose the laptop they want to use. Fujitsu is likely to be the biggest loser as the British government looks set to make its contracts more flexible and insource some of the aftersales support. Cabinet Office minister Francis Maude confirmed at a recent event that the move could mean savings of at least 40% and give the public sector more flexibility and agility, a lot of which is due to the inherent characteristics of working on the cloud.